This amp is a direct broadband connection to the musician’s brain. You wouldn’t believe some of the stuff that is floating around in there. Headphones are usually given little thought. They come packaged with personal CD players and are widely considered disposable. This is unfortunate, as headphones can be so much more than cheap plastic speakers clipped to your head. A proper headphone system provides a listening experience of remarkable intensity, second only to a masterful live performance. When listening to a quality headphone system your world compresses, shedding all non-music elements, until the listener is left only with sound and self. Not at all like loudspeakers, which mimic a live performance; but rather headphones are a port to the ____ness of the recording. This means that a good headphone system demands excellent production, exposing every flaw and every scrap of gimmickry used to camouflage a shoddy vocal or clumsy instrumentation. The Wheatfield Audio HA-1 is a tube headphone amp that provides a listening experience unmatched by any solid-state headphone amp. It delivers every detail no matter how minute, yet is able to handle the broad strokes of bass and large percussion without sounding weak. Vocals are liquid and transparent, resulting in the impression that the listener is the microphone. It is ideal for listeners with far-flung musical taste, strings and ethereal vocals are unadulterated, while distorted guitars are given all the manic energy they demand; steam or tsunami, the HA-1 is perfectly adapted. Evaluated either on pure performance, or on performance-per-dollar the HA-1 is brilliant. big, open sound"field", relaxed, easy nature, great deep subterranean bass. Detachable AC cord. Plitron Torodial transformer. Appearance a little rough (cream colored case makes it look cheap, faceplate could use a little help too--make it BRUSHED aluminum!). 7044 output tubes might be tough to replace? Overall a very "musical" piece. Easy, relaxed nature, without giving up too much detail. However, not quite as much detail and "snap" as the Musical Fidelity X-Cans v2. The "soundfield", with HD600's is very expansive and open, again, with outstanding bass (no doubt due to the Plitron transformer). Minor nit-pick perhaps, but I re-painted my case with powder-baked satin black metal paint--it looks a hundred times better! Also really expect to see ceramic tube sockets at this price point. Overall it serves the music well, but a tough sell over the X-cans v2 (for HALF the price). Well Tempered Labs "Classic V"
Open and 3d sound. Well built. Severe lack of presence. Cheap pot. Ugly. This was purchased in the feeble attempt to find a product that had both the incredible openess of the Headmaster and the lush sweetness of the Earmax. I have to admit the soundstage was quite good. Not as wide as the Headmaster but with the benefit of some tube ambience. It's all downhill from there though. This amps greatest sin is the midrange. It's paper thin, honky, and slightly forward up top. Vocals are downright nasal. The bass is nice and tight and goes low enough but suffers from the lack of any sense of weight. Treble is veiled and abruptly cut off. This amp would be right at home with the $270 budget amps, but at $529 it's incompetant at best. For a bit more money the Earmax is so much better it isn't even funny. Thank God for Headroom's return policy. Headroom Airhead, ASL MG-Head DT, X-Cans V2, Sugden Headmaster, Earmax Pro. Neutral, natural, musical sound. Drives most dynamic headphones easily, Preamp outputs, low noise. If you have a good pair of headphones and don't yet have a headphone amp to make them sing, this is a wonderfully good place to start no matter what kind of music you enjoy. I listen to blues, pop, rock, classical, jazz, and a lot of new age music. Everything sounds it's best through this headphone amplifier. I enjoy listening to music on a variety of different systems, each a trade-off on price, size, and performance. 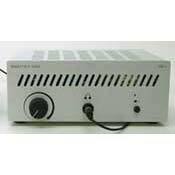 However, even my best electronic preamplifier (NAD Monitor Series 1700), which succeeds in producing great sound from a wide range of amplifiers and speakers, including my own and those of my audiophile friends, doesn't have a headphone jack that can come close to the sound from the HA-1. The HA-1 has a lower output impedance (~30 ohms), a single gain stage, and generates the most open and effortless sound from my Beyerdyamics DT831s (a good choice in a closed headphone for taking out some of that unwanted background noise). If you wants something warm and lush sounding, try a CJ or perhaps the HA-2. Get one, and rediscover your entire music collection. I did. And BTW, even though it is not the most beautiful piece of electronics in my collection, it does thankfully look a little better in person than in the photographs. The Wheatfield HA-1 is warm, smooth, with great detail and balance (and yes you could say sweet). Found it to be a great match with my Arcam Alpha 8se (which supplies a lot of detail) with a pair of AKG 501s (detail plus - if you like acoustic instruments these cans deliver). I tried the Sennheiser HD600s but prefer the AKGs. Since I have not heard the HA-2, there may be a better headphone amp out there. I like the HA-1 so well that I'm not even going to try the HA-2 (it could cost me another $300). At some future date I may go for the HA-2 with an Alpha 9 upgrade, however. A very smooth sounding amplifier, with no detectable noise, great with the Sennheiser headphones, models HD-580 and 600. Great build quality and circuit layout, cabinet has plenty of ventilation for heat, sturdy, cream color with aluminum front panel. Something besides basic black, perhaps Mr. Millett will add black as an opotional color in the future. The unit does as its design is intended to give you the most musical sound for the money, which is a steal compared to other systems. Build quality is first rate and will last a long time. Amplifier uses the 12AU7 tube for the front end and the triode 7044 outputs, Highly recommended overall for ALL headphone load inputs! Low Level Detail,Large well defined soundstage,BUILD QUALITY!!!!!! After trying several other amps in over a year, my search is over! HEADPHONE HEAVEN!!!! First the HA-1 needs at least 200 hours to break-in,but its worth the wait.Well balanced frequency response,excellent low level detail,wide open soundstage .Used with Sennheiser HD-600,Adcom GCD-600,Silversonic interconnect.Wheatfield hit a Home Run with this amp!! !